For our final beard trip of the year, we take you to Portland Oregon for the 2014 World Beard and Moustache Championships. As with all our other beard adventures we ran into nothing but good-hearted people with personalities as big as their beards. The first day kicked off with a rainy parade around Downtown Portland. In Portland it seems like a full marching band, bearded comrades and people parading around is a pretty regular business. We blended right in and were joined by regular folks the whole way through. By the end it was hard to tell who was part of the competition and who was just a local enjoying the fun. Competition day bought out the crowds and the costumes! Besides the facial hair strutting, there is a lot of creativity among the competitors. 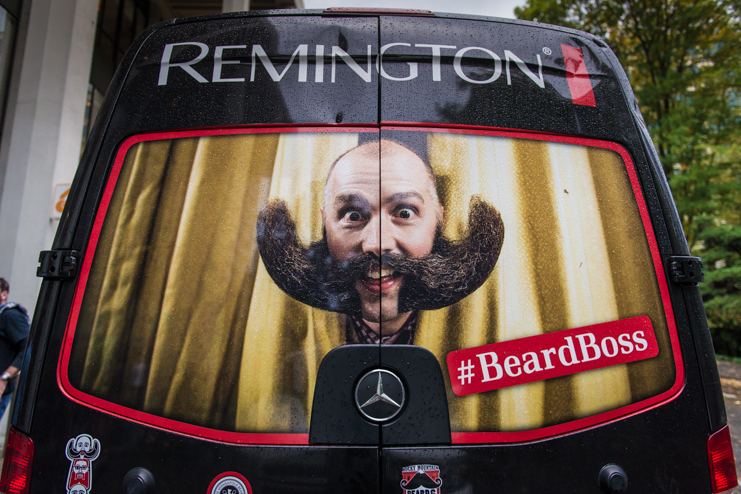 We are always rooting for our Remington Beard Boss pals to bring home the prize though! Ryan (the red-bearded musician extraordinaire) and James (the moustache king of Milwaukee) rocked it in their categories but unfortunately didn’t make top 3, Chris (the freewheelin’ whirly-gig-bearded taxi driver) got second in his ultra-competitive category and MJ (the international Imperial Partial beard sensation) easily won his category and came in 2nd to winning the entire championship! Nice work guys! After the Remington Mobile drove off into the sunset we enjoyed a couple more days of the Portland rain/sun combo. We had some VooDoo Doughnuts, thrift-shopped, went to the downtown market and slammed some Pine State Biscuits. We did it all from the comfort of our home-base at a delightful Air BNB. Portland is a great community and every neighborhood is as easy as pie. It was nice to get to know Portland and the bearded entourage better on this trip. wonderful, what is this drinking out of cups on a board? – am i missing something? Shot-Ski’s! I take it you’re not from Wisconsin.